The little bag filled with a red-colored liquid is liquid iron, the chemical composition of which is unknown to me. If a human being's hemoglobin readings—red blood cells—are low, the simplest, most straight-forward, and speediest means of increasing them are iron infusions. Iron infusions make me cold. Thus, the hoodie. Iron infusions are done in a hematology/oncology setting, and so even though the reason for my low hemoglobin levels isn't cancer, I journey to a local cancer treatment each week and sit among patients receiving chemo-therapy. My parents died of cancer, but I never accompanied either them into a treatment room. In fact, twenty-some years ago, my mother's chemo-therapy treatments were so stringent that she spent two-to-three days hospitalized. 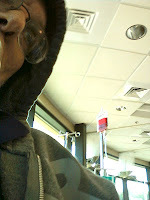 Now it is my turn to sit among people having their cancer cells poisoned. It's an interesting experience. Nearly everyone is middle-age or older, with one or two people I've met appearing to be well into their eighties. Some are nonchalant. Some are weary. Some appear nearly beaten. The facility is new, with a treatment room equipped with twenty or more recliners, plus chairs for those there to support friends or family, a large-screen television, and a small refreshment area with coffee, tea, fruit juices, crackers, and cookies. There is a large bank of floor to ceiling windows facing north, and beyond the parking lot and a road, there is a pasture with two horses and a donkey grazing. After five treatments, I've begun to think that the center hires staff on the basis of personality as well as professional skill. Nearly every one of the registered nurses and supporting technicians, all but one female, are upbeat and cheerful, which in turn influences those there for treatment in a positive way. The physician is Russian, born in the Ural Mountains in a small village above the 54th latitude, and he seems careful and deliberate, always sitting beside the patient with pen and paper and speaking slowly so that the complexities of modern medicine are not warped by his accent. Cancer is an extraordinarily ugly and vicious disease, and its attack on some there is evident from the injured souls which can be perceived in their eyes. The staff jokes with everyone, but I see them stopping and asking about an individual's comfort, seemingly able to judge in a glance whether a person is cold or needs something to settle a stomach. It must be a difficult place to work, this building where there is so much pain, where the battle continues for months or even years, for in some cases they can act only as a thumb-in-the-dike. Perhaps it is the other cases, those where the demon is destroyed which allow them to soldier on so cheerfully.